As key battles continue in Virginia and Georgia, the news this day emanates from the United States capital of Washington, D.C. Yesterday Secretary of Treasury Salmon P. Chase submitted his resignation … for perhaps the dozenth time. But whereas President Abraham Lincoln had in previous instances rejected Chase’ resignation, yesterday the president, to the surprise of many, accepted the offer. Lincoln’s reversal of course comes in the face of a depleted national treasury, a perilous situation as the United States makes a concentrated effort to successfully conclude the War Against the Rebellion. In the place of Chase, today the president appoints William Pitt Fessenden of Maine, long-time chair of the Finance Committee of the Senate. Although Fessenden accepts the appointment with reluctance, his work in the months ahead to shore up the nation’s finances proves crucial in negotiating a bond issue that provides the Union with the necessary funding to defeat the Confederacy. Meanwhile, today’s Memphis Daily Appeal offers glimpses into life in Tennessee, a long-divided state now largely under Union control and in the process of being reconstructed even as the war continues. 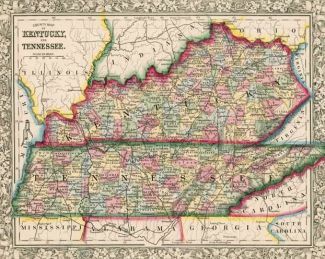 The Misses Wade, daughters of a respectable citizen of Rutherford county, who went South on the arrival of Yankee troops some time ago, returned to Murfreesboro’ the other day. The crops in Rutherford county are said to be quite fair. . . .
Brigadier General Paine had nine bushwhackers shot on the public square in Lynchburg, Lincoln county, Tenn., and several in Fayetteville. Among the number was Brigadier General Massey, C. S. A., who superintended all the guerrilla operations in Middle Tennessee. Gen. Paine told the citizens that if they wanted to fight the Government, to go and join the rebel army under Joe Johnston. If they staid inside the Federal lines, they might think, feel, die secesh, but if they talked or acted treason he would make them houseless, homeless and lifeless. . . .